If you like Minnie Mouse and your coffee or tea in a cool mug then you should check out this Minnie Mouse skirt mug. 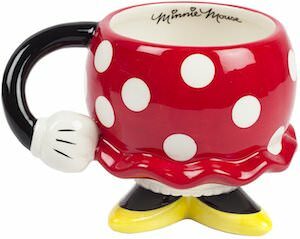 The mug looks like the lower part of Minnie’s body from her yellow shoes up to her dress in red with white dots and then her arm is the handle. On the inside you just find the name of Minnie Mouse so that you know it is real. So this mug is like you are drinking your favorite beverage out of Minnie Mouse and this is a mug for everyday use as it is microwave and dishwasher safe so that it can be your everyday mug.